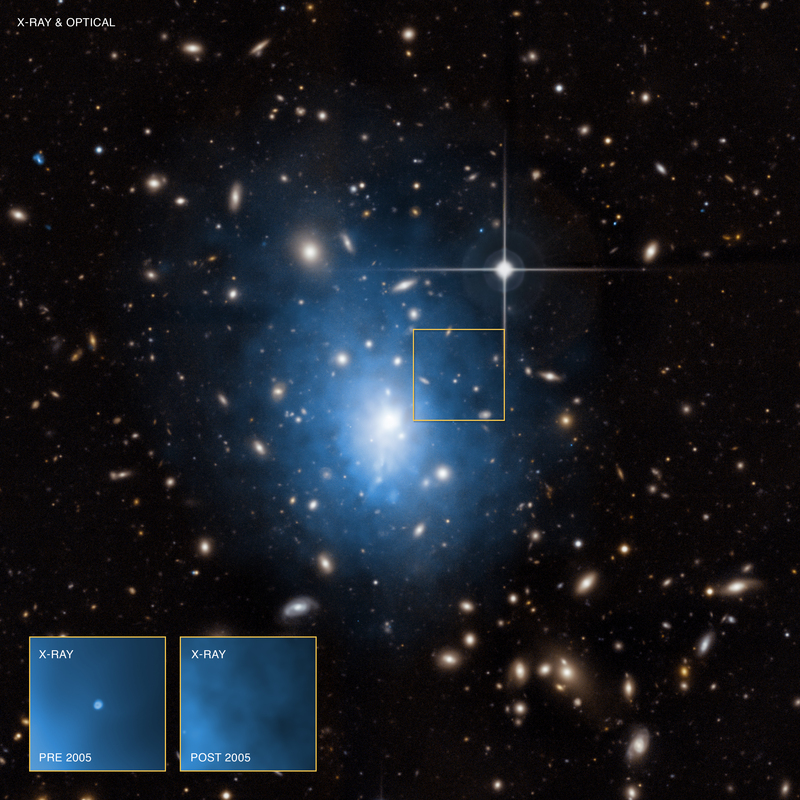 Abell 1795: Death By Black Hole In Small Galaxy? 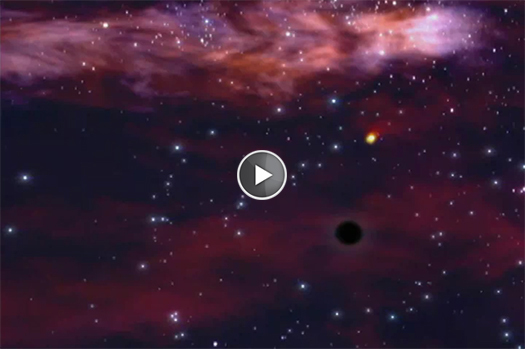 A bright flare seen with Chandra provides evidence for a black hole having torn a star apart. This may be the first such recorded event in a dwarf galaxy, a much smaller galaxy than the Milky Way. The dwarf galaxy is located in a galaxy cluster about 800 million light years from Earth. A bright, long duration flare may be the first recorded event of a black hole destroying a star in a dwarf galaxy, as reported in our latest press release. The dwarf galaxy is located in the galaxy cluster Abell 1795, about 800 million light years from Earth. A composite image of the cluster shows Chandra X-ray Observatory data in blue and optical data from the Canada-France-Hawaii Telescope in red, green and blue. 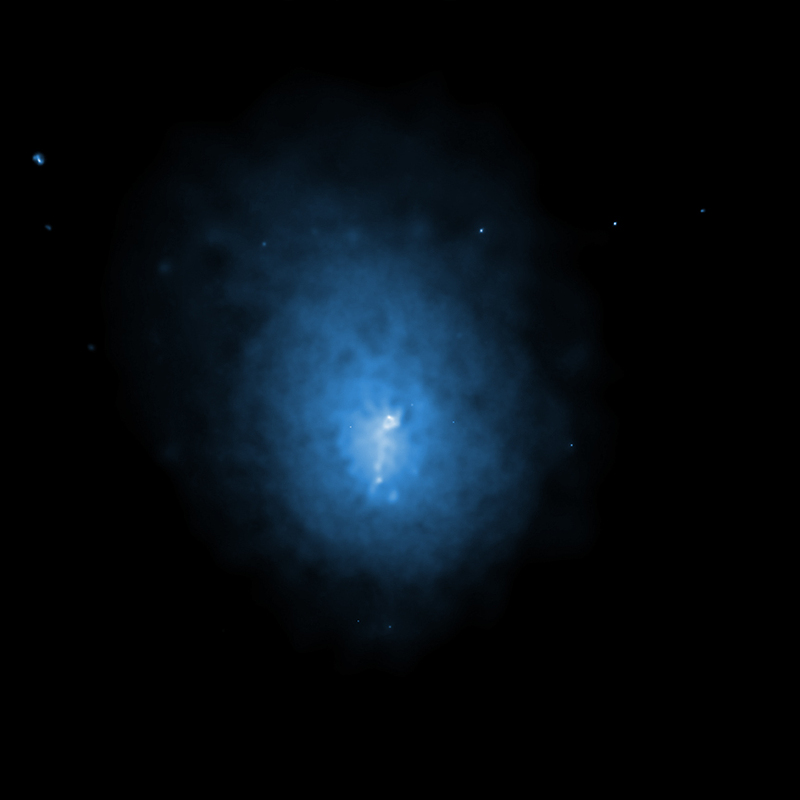 An inset centered on the dwarf galaxy shows Chandra data taken between 1999 and 2005 on the left and Chandra data taken after 2005 on the right. The X-ray flare in the inset provides the key evidence for stellar destruction. A star that wanders too close to a supermassive black hole should be ripped apart by extreme tidal forces. As the stellar debris falls toward the black hole, it should produce intense X-rays as it is heated to millions of degrees. The X-rays should fade as the hot gas spirals inward. This discovery was part of an ongoing search of Chandra's archival data for such events. In the past few years, Chandra and other astronomical satellites have identified several suspected cases of a supermassive black hole ripping apart a nearby star. This newly discovered episode of cosmic, black-hole-induced violence is different because it has been associated with a much smaller galaxy than these other cases. The black hole in this dwarf galaxy may be only a few hundred thousand times as massive as the Sun, making it ten times less massive than the Galaxy's supermassive black hole. This places it in what astronomers call an "intermediate mass black hole" category. Two independent studies reported observations of this event. The paper led by Peter Maksym is available online and was published in the November 1st, 2013 issue of the Monthly Notices of the Royal Astronomical Society. A paper led by Davide Donato and colleagues is available online and has been accepted for publication in The Astrophysical Journal. Coordinates (J2000) RA 13h 48m 52.70s | Dec +26° 35' 27"
About 820 million light years from Earth. Combining X-rays from Chandra with optical data from the Canada-France-Hawaii Telescope . About 1.5 million light years. X-rays are blue, optical red, green and blue. In the constellation Boötes in the Northern Hemisphere..